Kiwi small businesses thinking of hiring new staff now have access to a new tool to calculate the cost of a new employee, giving them more clarity when making these important decisions. A new Employee Cost Calculator launched today by Small Business Minister Craig Foss. Developed by Business.govt.nz at the Ministry of Business, Innovation and Employment (MBIE), business owners can now quickly estimate the fixed and discretionary costs of a new employee. Often when businesses are in growth mode, they're bringing on staff to drive demand and handle that growth. This can be dangerous when you don't have a good view of what your staff costs will look like a year on. And unfortunately I've worked with a few businesses who have got themselves into trouble by not anticipating exactly how expensive their staff costs might be. This tool will be immensely helpful to understand exactly how much it will cost and to grow with confidence. Owners can select from various categories in the tool, such as salary or hourly rate, industry and role type to find out the real cost of employing someone and ultimately give them more confidence to take the next step. The tool pulls data from government agencies and Trade Me Jobs so that business owners get a real picture of how much it cost to employ someone. In addition, owners can see what they will need to pay straight away, and get a breakdown of the compulsory costs like ACC levies, KiwiSaver contributions and Fringe Benefit Tax. It also includes the cost of of employing someone in the first year, and a monthly ballpark for better budget management. Information generated from the calculator can be saved to compare different options such as hourly rate and to see what impact that has on the bigger picture. 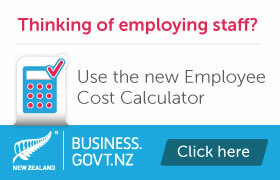 The Employee Cost Calculator is part of a package of tools being developed by Business.govt.nz. We would encourage any business owners to give it a go so you are confident and informed when it comes to the costs of employing someone. Check out Xero's Small Business Guides – Hire the Right Employees or How to build your team for more great insights. A variation of this post appeared first on Xero Blog.